Destruction Unit are in town, ready to decimate at Palisades tonight (6/26) and the free “Summer Thunder” Union Pool show on Saturday afternoon (6/27). The Summer Thunder show was originally supposed to have Pampers on the bill as well, but they have had to unfortunately drop off. In their place will be Beech Creeps, and Cheena play as well. Speaking of thunder, Saturday’s weather forecast is pretty dicey but if it is raining, bands will either play under the covered portion of the patio or in the indoor performance space. Either way, it’s free and starts at 2 PM. If you want to keep the fun going at Union Pool, Grooms, Rips and Broken Water play Union Pool’s Saturday night show. 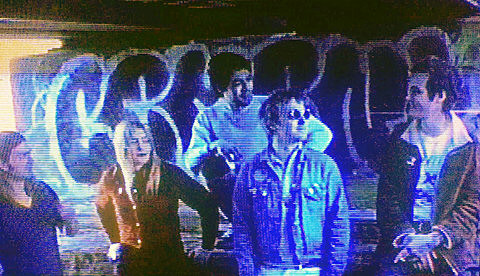 In related news, Cheena (who are also playing Gonerfest in Memphis) includes Margaret Chardiet whose main concern, Pharmakon, will play the second day of the two-day Summer Scum IV festival at Trans-Pecos on July 18 & 19. The fest goes all-day both days, featuring a cavalcade of noise, drone, outsider music and, of course, scum. 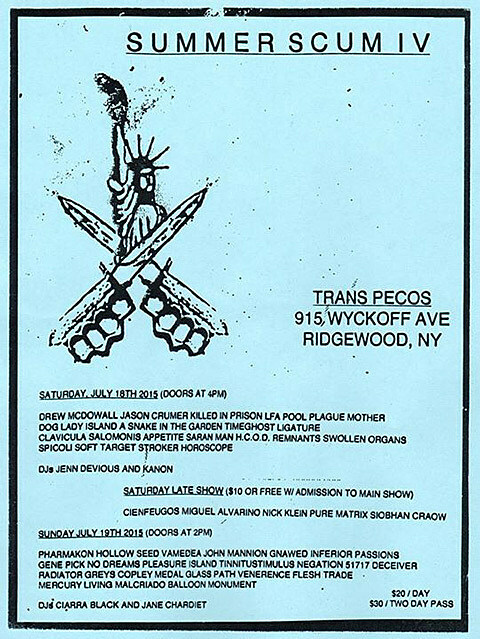 The lineup also includes Drew McDowall (Coil/P-TV), Pool (members of Container, Kites, Spiritual Recess), Gnawed, Hollow Seed (Jesse Allen of Migrations Rust) and at least 40 more acts. It’s $20 per day, or $30 for both days. Full lineup, schedule and Summer Scum IV flyer, below. Cheena, whose lineup also includes members of Crazy Spirit, Dawn of Humans, L.O.T.I.O.N., and Hank Wood & The Hammerheads, released their debut 3-song single on Sacred Bones this past spring. You can listen to that in full, below.